The real Miss America! This photo was seen on AllMilitary.com and we just had to share. We're so proud of our men and women serving our nation! This week 7,480 cards were mailed out - at a cost of $275.00! Big thanks to all who donate the funds to cover shipping, crafters who supply the cards, and our hardworking volunteer shippers who process and pack everything to mail out! 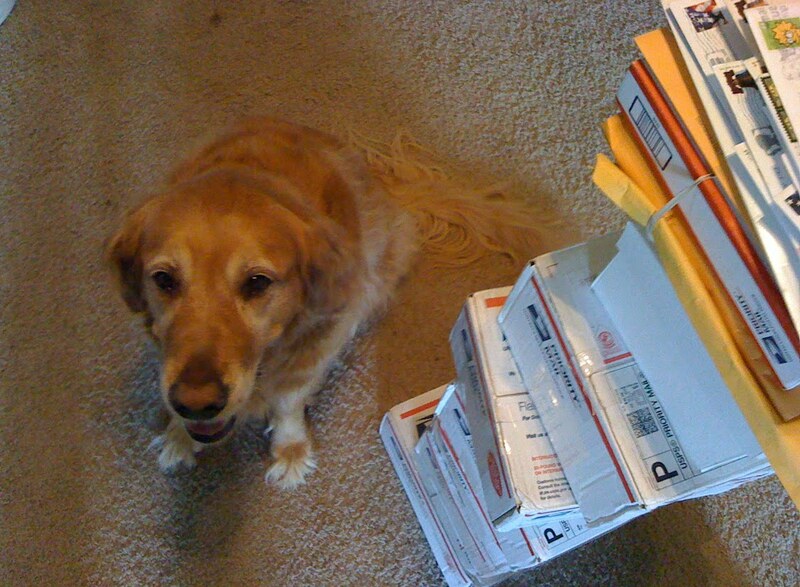 11,587 cards were received, stamped, tucked, sorted, and prepared for shipping by our wonderful shippers this week! Yowsa!! That's incredible to think of all that creativity coming together for such a worthy cause. Thank you all for sharing your talents with our heroes! 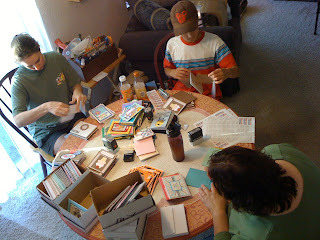 This week a few cardmakers came over to help Sandy sort in Washington. They handled over 1400 cards in one night - job well done! The young man pictured here, Thomas, had brought with him a bunch of his own cards, pictured below. Way to go Thomas! Terri E, Grand Junction CO.....thanks for these awesome cards! Cathy & Irene S and residents at Rossmoor Sr. Community, Walnut Creek CA.....thanks for taking time to make these cards for our heroes! Connie B, Nixa MO......thanks for these awesome cards!! Paula P, Rathdrum ID, your cards are always so pretty- and your selections are perfect! It's as if you know what my shelves need. Thank you! Rosemary D, Tacoma WA - wow, your cards just tickle my fancy....imagine what they'll do for our heroes! Thanks! Anne M, Venture In Crafters, Show Low AZ....thanks so much for sharing your talents with our heroes!! Thank you to our anonymous donor in Bellingham...beautiful cards!! Dee M, Puyallup WA - your cards are so stinkin cute! Thank you for your generous donation as well!! Jennifer S of West Jordan UT - these cards are so pretty, thank you so much! Ellen H, Vancouver WA - your triage center ROCKS! Big big hugs! Ann K, Seattle WA - these cards are lovely! Your niece is very talented too....great job!! Sherry N of Bonney Lake WA...your cards are breathtaking! Thank you soooo much! Nina & LJ A, Hawthron Woods IL...thanks for this great package of cards! Roberta O, Lafayette IN......Thanks for these awesome cards! Dawna L, Bloomington IN......WOW! These are awesome cards! THANK YOU! Marcia M and friends, Cedar HIll MO......thanks so much for this rockin' box of cards!!!! Fabulous! Betty S, Allen TX......WOW! This is a box of gorgeousness!!! Love them! Mary P and Meadowbrook Christian Church, Mt Vernon IL.......WOW! These two boxes are full of fabulousness!! Thanks so much for sharing these great creations with us and our heroes! Ms Flesher, Celina TX.....thanks for this awesome box of cards....they are fabulous! Tiffany B. and Jackie B. in Miami, FL, thank you for these beautiful cards! I needed these "Thinking of You" cards!! Cheryl B. of Manchester, NH, thank you for the cards! Awesome job! Love the "Thinking of You" cards! Harriet L, Vista CA, thanks so much for the packet of cards - they're beautiful! Nancy C of Hollister CA, thanks so much for the huge box of cards...wow! Lovely! Cindy E and the Los Gatos Elks...you've done it once again, another great box of cards. Thank you! Treasured Memories, Reno NV - I am so impressed with yet another box from your crop! Thank you so very much! 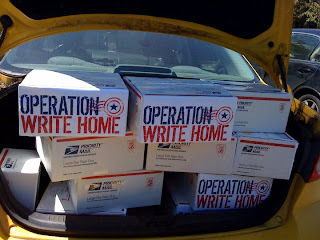 Judy J, Mission Viejo CA, these cards are very very pretty--our heroes will love writing home on them! Ruth T and Mason C of Carpinteria CA, thank you so much for this lovely box of cards....families across America will love receiving them! 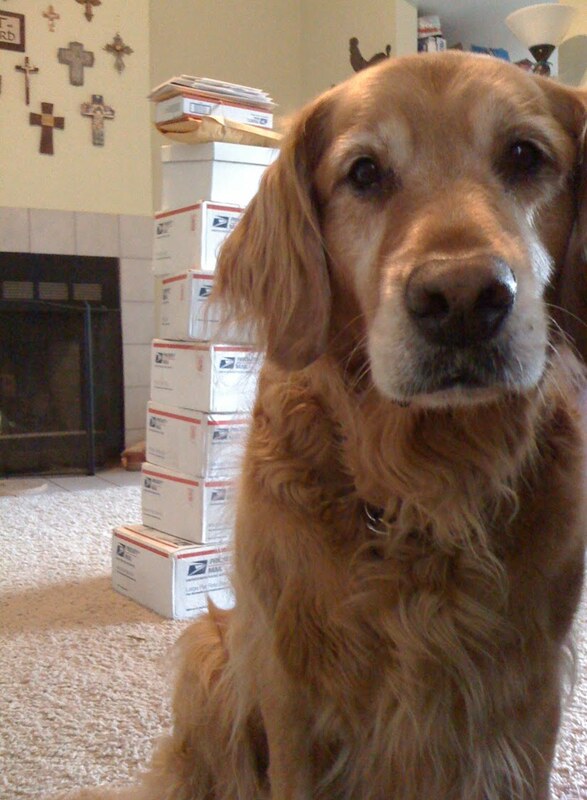 Shelly H, Twin Falls ID - love your box full of cards, wow! Thanks so much! Brenda U, Katy TX......this is an awesome first box of cards! Thanks so much! Nanette B and The Pikes Peak Sunday Stampers, Colordao Springs CO.....AWESOME cards ladies!! Jan A, Gladwin MI.....thank you for these great cards! Bonnie E, Tyler TX.....these are beautiful! Thanks so much for sending them in. Ginna C, Firestone CO......thank you so much for these wonderful cards!!! Shirley G, Carbondale IL......wonderful cards! Thanks so much! Mary P and Meadowbrook Christian Church, Mt Vernon IL......another absolutely fabulous box of cards! These are great! Theresa D and Thomas H of Kent WA....wow, your cards are SO cute. And you are SUCH amazing stampers-of-card-backs, thank you for a whole evening of hands-on help! Ginny B, Shawnee KS.....thanks for these wonderful cards and Any Hero notes you dropped off at my house. Was nice to see you again! Diana H, Centennial CO.....another fabulous box of rockin cards! Thanks so much! Janis D, Olustee OK......these are gorgeous! Thanks so much. Erica J, Manteno IL.....thanks so much for these awesome cards! Susan D, Tinley Park IL......GORGEOUS! these holiday cards are wonderful! Rosalie R, Macomb MI......another awesome package of cards! Thanks so much! Carole Ann S, The Woodlands TX......WOW! What a great happy box of colorful cards! These ROCK!! Thank you! Betty T, Salina KS.....Thanks so much for another fabulous box of cards!! Love these! Terry B. of Novi, MI, thank you for the beautiful cards for our heroes! They'll love sending these home to their loved ones! Nancy F. in Trexlertown, PA, thank you for the pretty cards, Hero Mail, donation, and the biggest laugh I've had all day! That turkey looks scared! Marie W, Cottage Grove MN - thank you so much for your generous donation! Carol G, Layton UT - thanks for the great cards and treats for our heroes - and your generous donation! Darlene M, Ridgecrest Ca, your cards are always so pretty...and your donation is hugely appreciated! Karen and the Scrap Sistaz - these are such cute cards! Awesome job putting them together at your retreat! Terri L, Grants Pass OR - thanks so much for the cards and donation!! Shannon P and Kellie S, Martinez CA - love these cards, wow! Great job!! Anyomous, Randon Lake WI....thank you for the package of cards! Tonight, the car's been loaded up...this is just one week, just one shipper. Multiply this week after week by three, and you get the scale of what we're achieving! including 204 AnyHero cards (17 in each box) *this wipes out Sandy's stash! And out of the 12 boxes, 5 are going to some of the 27 heroes on our waiting list. The rest are this week's rotation from Sandy's "regulars" - with the five new ones, that rotation is now at 48 heroes who get a box every 5-6 weeks! What waiting list, you ask? As we receive requests, we add them to a list on a private blog for our shippers. Each time a shipper has capacity to add another to their regular rotation, they snag the oldest name on the list. The 27 heroes on the list now have only been there a few weeks or less - the one waiting longest signed up on August 8. Yes. that means 27 requests since August 8! Please don't let this 'panic' anyone - keep on making beautiful cards! We'll get through the list. Take your time. Don't try to slap cards together just to get a lot made....we can't have them fall apart, or not meet up with the standard of beauty that our heroes are coming to expect! (Which is why they keep passing word to everyone else about our cards!) We want these cards to be so special that, if a card happens to be the only communication a family ends up with from their hero, that it is a card that lasts and becomes a treasure for them, not just a quickie without TLC poured into it! This week 10,950 cards were mailed out - at a cost of $400 exactly! We've also surpassed a shipping total of $20,000! Nearly half of that has been spent in 2010 alone - which tells you we're mailing out a lot of boxes. 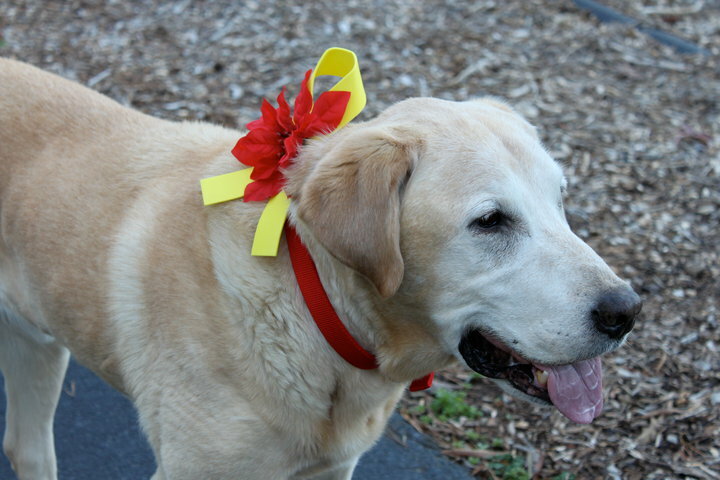 Many many thanks to all those who make financial donations to help with those costs! Many of you have been asking how the planning is coming - and it's been fabulous! We have sites lined up across the web who are sharing in the celebration! No party? Have your own Card-a-thon! You can still celebrate, but do it on your own as you have time throughout the month. It's easy! Set your goal for the month. Will it be a card a day? Two? 20 a week? Thirty days hath September, so figure out what you think you can accomplish during your own crafting time. Make your commitment in the Cardathon widget in our blog sidebar at right. We'd love to see how many everyone's got going! **I'm supposed to get a daily report from this fancy widget. If it works, I'll also start a ticker so we can see how many cards are committed for September! Set up a Firstgiving page, and ask your friends and family to sponsor you per-card, or with a flat rate donation if they'd prefer! Plan for success! In August you can get cardstock cut and folded, have envelopes on hand, and stock up on adhesive. We hear rumors that some folks are stamping the backs of their cardstock ahead of time, to save time later! Be ready to mail your cards in at the end of the month! Pick up flat-rate packaging at the Post Office and label the box with your closest shipper's address. We'll have DAILY inspiration for you on the Stars and Stamps blog throughout September - challenges hosted either on our site or on others around the web. You'll have those to keep you motivated as the days wear on! Facebook fans will get a birthday card every day to feast their eyes on...become a FB fan to get all that creativity served up on your home feed. Bloggers: Help us spread the word! Add a badge to your blog for our birthday, and write up a post about your own goal for September to inspire your readers. Give them some of the usual tips as reminders (no glitter, A2 size cards, etc!) and challenge them to join in the fun! Our little mascot has now made it onto some cute coloring pages for kids...just in time for back-to-school! Here are a couple samples colored by the kids of one of our heroes - aren't they CUTE! This Thursday....we have to say a special thank you. Not to a someone, because she didn't want recognition. But you all should know there's a crafter who sent gorgeous cards to a couple of our shippers, and simply called herself "An Honored American." How touching! This is one of her beautiful cards, and though she didn't want recognition, her heart represents that of so many of our OWH family. Now, on to the report for the week...thank you everyone for your amazing creativity and donations shared with us for our heroes....our work continues day after day, week after week, month after month - because of you! Sandra E. of Old Hickory, TN, thanks for all this Hero Mail! Awesome!! Thank you Scrapbook Concepts Card Makers of Florence, SC! Your cards are outstanding! So many designs! 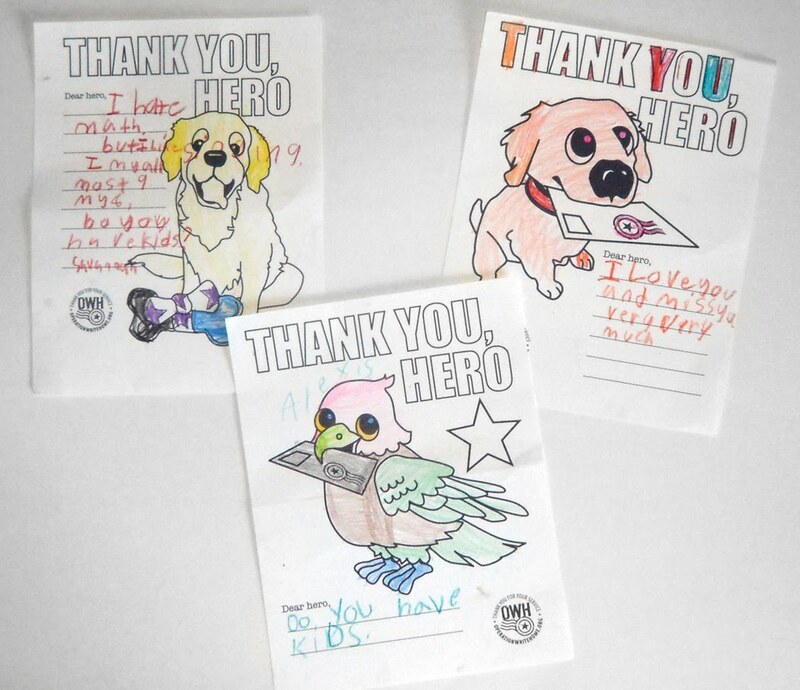 Ruthanne A. of Blairsville, GA, thank you for the cards, Hero Mail, and donation! You made me laugh out loud!! Marge M. of Wayne, NJ, thanks for the terrific cards! Thanksgivig cards are fabulous! Meredyth P. of Grand Rapids, MI, thank you for all the lovely cards! You're very talented! Thank you, Ziff Brothers Investments of New York, NY, for the cards for our heroes!! 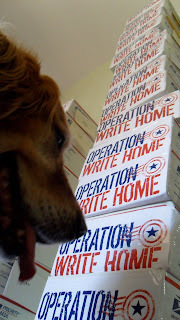 Thank you, Virginia S. of St Augustine, FL for your generous donation for shipping! Michelle S. of Pendleton, IN, thank you for these clever cards for our heroes! Sandi G. of St. Petersburg, FL, thank you for these cards!! You're so clever! 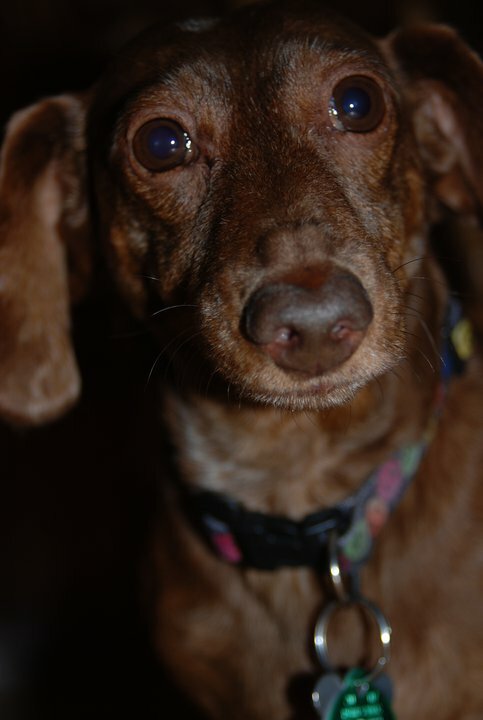 Cynthia D, Orem UT - cute cute cards, thanks so much for your AnyHero notes and donation too! Thank you card makers at the Glenmoor Lifecare Community in St. Augustine, FL!! Wow! You all are talented! Cindy W. of Randolph, NJ, beautiful cards! Thank you! Love the "What's brewing?" cards! Clever! Eileen M and friends, St Marys PA - oh my! Your best box of cards yet, thanks so much!! Particia F. of Hixson, TN, thank you for the cards and donation! LOVE the birthday cards for dads! Clever! Betty B. of Conroe, TX, thank you for these lovely cards! Such a nice variety you sent!! Nancy M, Fremont CA - I always love getting your boxes, thanks once again! Sheila G, Puyallup WA - awesome half and half cards---you're such a wizard with your cricut! Tracy C. of Allentown, PA, great collection of cards! The holiday cards are my favorites! Thanks for the Hero Mail too! Lily H. of Pittsburgh, your cards take my breath away! I'm dusting off my calligraphy pen nibs!! Thanks for the cards and the generous donation! Cecilia S. of Red Bank, NJ, thank you for these uique cards for our heroes! Thanks for the Hero Mail too! Awesome! Marcheta P. of Middletown, OH, thank you for this huge collection of beautiful cards for our heroes! Wow!! Ellen H, Vancouver WA - your cards are only outdone by your hospitality - thank you! Diane S. of Raleigh, NC, thank you for the cards and the Hero Mail! Awesome cards for kids! Karen K, Murchison TX.....appreciate these Any Hero cards!! Cindy M and Friends of Checkered Cottage, St Louis MO....WOW! This box is full of fabulouness!! THANKS! Helen M, Spring Creek NV......what a great box of Halloween cards! Love them. Donna D, Junction City KS.....these are beautiful! Thanks so much. Debby M, Las Cruces NM......fabulous, gorgeous cards! Thanks so much. Melinda B, Tulare CA - these cards are lovely, our heroes are going to enjoy them! Sandra W, Las Vegas NV, what a wonderful first box, WOW! Awesome - thank you so much for everything! Esther E, Vancouver WA - thank you for the amazing cards - and the amazing vacation! You are awesome!! Anita A, Turlock CA, your cards are so darned cute, thank you so much! And for the donation as well, you're so generous! Jessica J of White Hall, VA and Deb H., thank you for these terrific cards for our heroes! Thank you too, Jessica, for the donation and the Hero Mail! Nancy M. of Henrietta, NY, thank you for the cards and the Hero Mail! You did a great job!! Barbara B and the 3rd graders at Turtle Rock - YOU rock! I love your AnyHero cards, just wonderful! Valerie B, Thronton CO.....thanks so much for these awesome cards! Reta M, Fair Oaks Ranch TX.....WOW! These are stunning!! 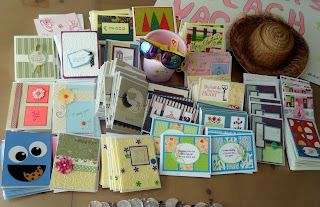 Ann M, Hutchinson MN.....another fabulous package of cards! These are awesome. Mary S, Lenexa KS......another box of fabulous cards! Thank you. Faye F, Fargo ND......WOW! What an awesome box. Love your style! Karen K, Murchison TX.....thanks for this wonderful box of cards! Martie M, Dayton OH.......GORGEOUS! Love your style! Robin M, Oconomowoc WI......thanks so much for this fabulous box of cards! Love them. Sue A, Rockford IL......WOW! Stunning, fabulous cards!! Janice Z, Hays KS....Welcome to OWH! Your first package is full of awesome cards! Cathy G, Villa Park IL......thanks for these beautiful cards! 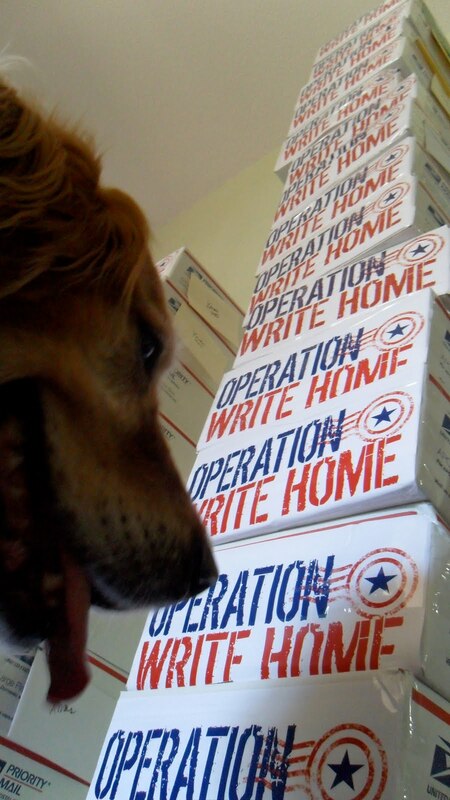 Heather W, Tacoma WA - thanks so much for your cards and donation - your support for our heroes means so much! Vicki and friends at Treasured Memories .... you had the most successful crop, WOW! Another box...you are amazing, thank you! Martie M, Dayton OH - your cards are so precious, thank you! Becky S, Cottage Grove MN.....thanks for this awesome box of cards. Love them! Kathie D, Antigo WI.....Welcome to OWH! Your first package was awesome! An Honored American......thank you for sending in these gorgeous cards!! Julie E, Santa Fe NM.....Welcome to OWH! Your cards are beautiful and much appreciated! 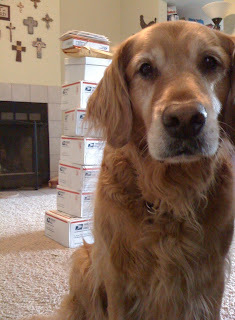 Janice A, Bountiful UT - I just love your cards, and I am positive our heroes do too...thanks so much for them! Your donations each time are such a huge blessing too...you rock! Adriana G of Canada...these cards are lovely! Bless you! Caryl W, Lake Elsinore, CA, your cards are so pretty - we oohed and ahhhed while unpacking them! Thanks for your generous donation too! Adele and friends at Cardmaking Parties for OWH - thanks so much, your cards are all so unique and beautiful - special thanks for sorting so nicely too! Scrappin 9 to 9 crafters, Lake Havasu City AZ, wow on these great boxes of cards! Thanks for having an OWH party and making so many beauties! Penny D. of Auburn, ME, thank you for this terrific collection of cards! Halloween cards rock! Sherry H. of Arlington, VA, thank you for the cards, donation and Hero mail!! Awesome cards for kids!! Kris B of Athens, GA, thank you! Lovely cards! So many pretty designs! Thanks too for the donation! Lori R. of Springfield, VA, love the denim pocket cards! Thanks for ALL the cards!! Awesome! Casey W. of Chattanooga, TN, thank you for this terrific collection of cards! Something for everyone! Thanks too for the Hero Mail and donation! Jeanine D. of Cleveland, TN, thank you for the cards! You sent such a nice variety! Love the "Gummy worms!" Thanks too for the Hero Mail! Sharon M. of Joplin, MO, thanks for the Halloween and fall cards! Love the spiders! Paper ones, that is! Jill B. of Hamburg, PA, thank you for the cards! Love the fall paper colors! Great sentiments! 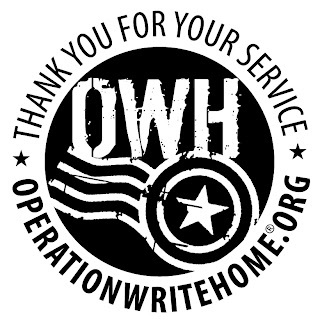 Alice J and Prospect Heights Public Library and Park District.....thank you so much for adding OWH to your events calendar and gathering all of these cards and Any Hero letters. Colleen M and Pilgrim Park Church Camp, Princeton IL.....thanks so much for these great cards, especially the awesome Any Hero letters! Thank you Debby L of Lexington, SC and ALL who helped make this huge box of cards! There was a lot of love in that box! Thank you to The Girl Scouts of Central and Southern New Jersey for ALL these greeting cards and Hero cards! You all did a fabulous job! Thanks Diane C. for pulling it all together! Nancy K, Hattiesburg MS.....another awesome package of cards. THANK YOU! Jeanne B, Champaign IL......FABULOUS!! These are great cards, thanks so much! Mary K, Wright City MO.....Awesome cards! Thank you! Collette L, Wauconda IL.....Absolutely stunning!!! These are gorgeous. Thank you. Siobhan S, Lyndonville VT......thanks for these great Any Hero letters. The heroes that read them will be thrilled. Rosalie R, Macomb MI......you are a rock star!! So many packages so many awesome cards! Robin G of Manchester, NH, thank you for these clever cards! Pretty designs and paper!! Caro H. of Mint Hill, NC, thanks for the cards! Thanks for picking up that BIG box too!! Jennifer M, Romeoville IL......awesome cards! Thank you so much for these beautiful creations! Ava K, Plainfield IL.....thanks so much for these great pictures. Our heroes will love hanging them up to decorate their spaces. Cheryl K, Crest Hill IL.....WOW! What gorgeous cards! Thank you. Sandy R, Manchester MO.......thanks for these beautiful cards! Bonnie B, Blooming Prairie MN......another great package of beautiful cards. THANKS! Anonymous, Katy TX.....thanks so much for these awesome Christmas cards. Tracy T. of Murfreesboro, TN, thank you for this terrific box of cards! So many clever designs! Wonderful! 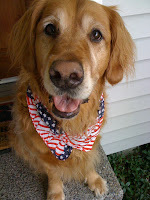 Thank you Carol L of Gilbertsville, PA and Jill D and Cherie too!! Wonderful cards for our heroes to send home to family and friends! Well done! Brenda M. of Independence, KY, thank you for the cards and the hero mail! Awesome cards! So pretty! Melissa C, Karen G, and Christina M, thank you for these beautiful cards for our heroes! Just beautiful! Thanks too for the hero mail!! MANY thanks to the Scrapbook Art/ Card Group in Lewis Center (Columbus), OH! Wowzers! Lots of talent in this group! Thanks too for the Hero Mail and the donation! Janet S, Astoria OR, thanks for sharing your talents with our heroes - they're going to love using your cards! Karen J, Astoria OR, I love your cards, and our heroes will too - thank you!!! Linda B, Burien WA - thanks for the Christmas and other themed cards - they're really beautiful! Andrea M, Ithaca NY, thank you soooo much - your cards with the digis are especially adorable! Nancy K and friends at Uncon Stake, Idaho - your cards are even cuter in real life than online - thank you!! Rich B, Sacramento CA - thank you for your very generous donation!! Wow, you're awesome! Please please be careful in how you enter for the Joann's Crafting for a Cause contest. I have been desperately trying to reach anyone to find out if we need to buy a whole new paper cutter, scissors, glue, and cuttlebug to qualify. Nobody's responding, they're still working out details. Hang onto your submission and be ready - we have a long while to get to submitting - so we are sure that we get this right. No sense in being disqualified if they change the requirements later on. Thanks everyone! The goal of the Craft for a Cause is to encourage Jo-Ann customers to make and donate a handmade item to their favorite charity, using products available from Jo-Ann. This does not mean that a receipt is required for every single item used, especially since many crafters may have or keep basic tools and supplies such as hooks, needles, pins, scissors, a sewing machine, etc. on hand. The "bulk" of the materials used should come from Jo-Ann with receipt(s) provided showing proof of purchase. For example, if you are crocheting or knitting a chemo cap, you can purchase the yarn but may use a hook or needles you already own to complete the project. You wouldn't be expected to re-purchase every tool solely for this contest. Thank you all so much; and feel free to always make your boxes half and half, anytime of year - we always have that same need to mix regular cards in every box with holiday cards. Winners names are listed below each prize....congratulations! We'll get your package out to you shortly! This week 10,531 cards were mailed out - at a cost of $387.50! The Half and Half Challenge has been a wonderful success this summer, getting us ready for the holiday shipping....Ciara's here posing with Sandy's boxes that are ready to go! On the far right, the really tall stack, is Halloween boxes, all with the appropriate mix of holiday with birthday, love, thankyou, and thinking of you. Many many thanks to all who keep us well-stocked with other-than holiday cards! The first of the Halloween boxes will start going out this week. The small stack, just two boxes, is Thanksgiving - both are mixed boxes. The next stack to the left is Christmas...these are alllll Christmas, so some wintry birthday, love, thinking of you, etc are needed to split these into two boxes. And the far left stack? Mixed Christmas with other themes, ready to go! Current shipper's biggest needs: see here. Y'all wanted a vacation for our fearless leader? This is how she spends it....making 237 cards with some dear friends, old and new! 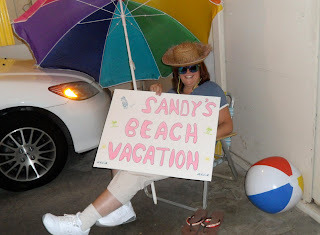 Sandy takes a moment to chill...yes, in the garage. It was 101 outside! And check out Jim's 3 words...he's our back-of-card-stamper! 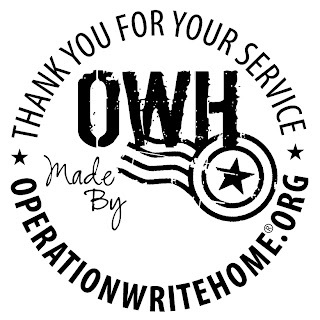 We are SO excited to have so many parties coming together....there were at least 10 already fully signed up on our site (http://operationwritehome.org/partysignup) and I keep hearing rumors of lots of others! I've had a number of folks ask me versions of the same question about their party, and thought I'd put the answer out here for all of you - usually if a couple people ask, many others want to know! How do you host a successful community-wide cardmaking event? The large community events bring in a lot of folks who really want to support our nation's heroes—and that is a GREAT thing. We love it! But, not everyone is ready to make a card, or cut out to do so without a lot of help. Their desire is laudable, but we get our largest "stash" of hospital cards from some of the large parties.....so we've provided a few tips for you so you can avoid that destiny for your creations. Start smaller than your BIG dream. You can have a trial-by-fire in front of you if you bite off more than you can chew, and our shippers will have many many hours of labor in front of them when your boxes arrive. (They have so much to do already, so sending a box of hospital cards isn't too helpful!) Your Birthday Bash doesn't have to be a big town event - it can be just you and a few friends, and work your way up to something big later. Have some smaller 'practice' events before a big community one, and build up your group of friends. You'll have more people to help with kits (#2), and more fun people to do it with, as well as to share expenses with. You'll learn a lot about what makes a "good" kit and what is "too hard" to do in a group setting - test things out on each other, and be honest whether or not you think a newbie can handle a particular level of complexity. Card kits. Seriously! It is a LOT of work, and often the kits take more hours to produce than the party itself to run. But it will assure that you'll come out of the event with use-able cards in the end, and that's what the goal is! Putting out piles of random supplies lead to piles of random cards in the hands of inexperienced folk; they don't know where to begin, or how to assemble anything, and often produce some sticker sneeze out of sheer frustration and lack of guidance. Make it easy for your attendees - write out instructions, provide a nice sample to follow, and have the parts well-prepared. They'll enjoy it, and you'll have a better box of cards at the end. If you aren't certain of your turnout, have extra supplies to create some of the kits on hand; that way if you need more kits for people to assemble, someone can be assigned the job of cutting papers to designated sizes to create more kits. Quality supplies. When hosting a large event, often cost is an issue; but remember that going cheap on supplies also means cards could fall apart and be useless, and the whole purpose of making cards is to have them used by our heroes. You can set a small fee to attend the event - $5 - and that can cover some of the cost of shipping, cardstock, or tape runners. If you ask crafty friends, they'll likely have some things to donate; local craft stores may have opened packages or partially damaged items to add to the mix. Shop online, too - tape runner refills can be a lot cheaper bought in bulk online than in a store. 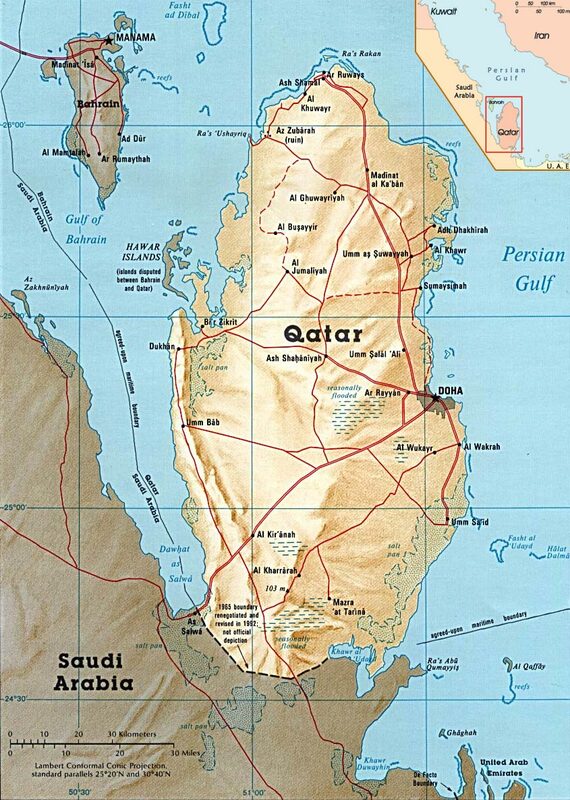 Some brands of gluesticks, though inexpensive, can work ok if applied in enough quantity, however, if supervision (#4) is not adequate, inexperienced folks will assemble a card that may not even last in traveling to the shipper much less to Iraq and back. Pool resources with your friends to get good supplies, rope them in to help teach people how to use the tools provided, and do a good quality check at the end. Supervision. Have someone at each table who is not only experienced at crafting but who knows the kits at that table. They should regularly walk around and monitor what everyone's working on, who needs help, and if a kit is not working out (too hard, too messy, etc), pull it from the table so you can avoid frustration for participants - they don't want to have a hard time making a card, and whatever you can do to make them successful will bring them back to your next event. Supervisors should gently guide struggling folks to the AnyHero station (#6). Kit setup. Most of the successful big parties have several kits at each table, with all that's needed for each card in a shoebox. That includes scissors, adhesive, tools, etc (be sure to mark them clearly or they'll walk away!). (You might invite participants to bring their own adhesive or tools with them to cart around as they move from table to table; some can't live without their ATG gun.) Explain at the start to everyone that they should move to each table and make one of each card (or pick a card and make them all, whatever format you'll be using.) Give clear instructions, and have something identifying you and the other leaders so they know who to ask questions of - wear a flower in your hair, have a nametag, or a certain color shirt. You can place a box at each table to collect finished cards, or ask people to bring them to the stamping station (#8) when they complete one. AnyHero Card Station. 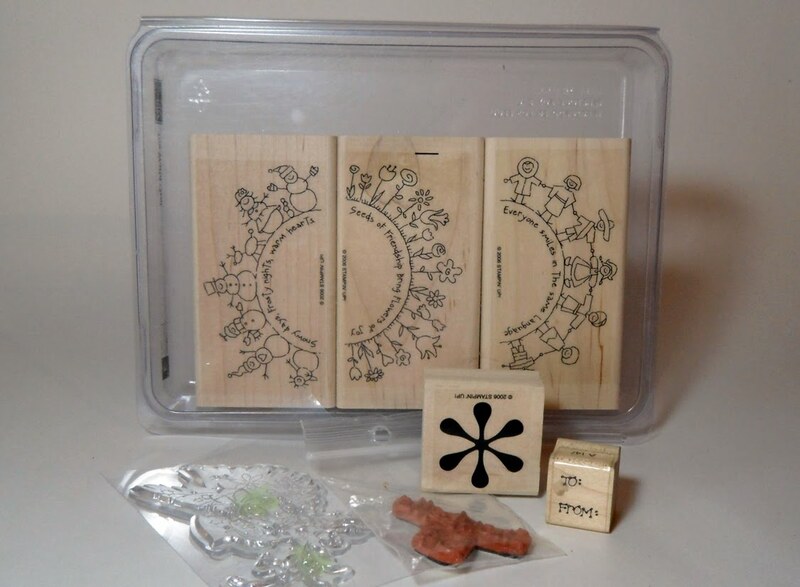 This is a great place to send those who struggle with the card kits; some folks will either be frustrated with trying to make cards, or perhaps you'll find their efforts would be best spent writing letters instead of crafting. :) If you have a readymade place for folks to write a note, it's a perfect invitation! You can have a simple card with a flag stamped that just needs colored and a note written inside, and they can feel like they're crafty in a very simple way. Or have stationery, AnyHero coloring pages, or premade or prebought cards to write in. 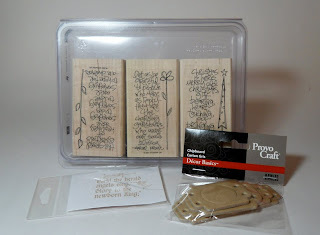 Stamping and envelope station. It helps so much to have cardbacks stamped. Hubbies are great helpers in this stage of a party! 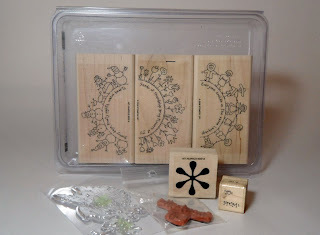 Have stamps and ink for them, and space to sort the cards. If you have 20 of the same birthday card, it helps to have them sorted together into the box, so the stamp-er can do that as they go. 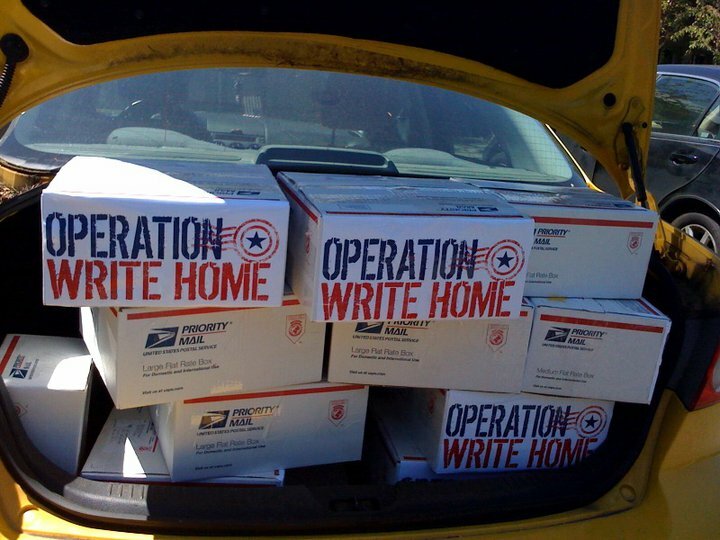 If you're able to provide envelopes, that is a huge help to our shippers; we're happy to spend the time and effort tucking, but if you have volunteers on hand, and a lot of people to donate a dollar or two for the cost of envelopes and shipping, why not take advantage of the power of your team? Teach "the tuck" to whoever's going to be operating the station. Packing and Quality Check. Have boxes ready for packing up your cards, and an experienced, responsible adult putting the cards in. Check for things falling off, or glue that isn't yet dry. Someone should count all the cards as they go in so the packing slip can be accurately filled out. Community ShoutOut! 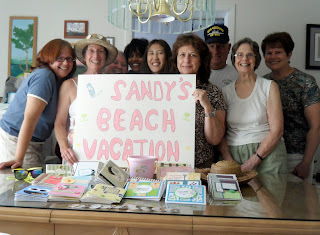 Just for fun....take a group photo of your cardmaking team! Include it in an AnyHero card from your community. Have everyone sign their name on one big card - you can print it when you get home and tuck it in the box before it's sealed and sent to one of our shippers. Post the picture on a community website, facebook page, blog, etc - and offer it up to your local newspaper too! Hope that helps give you some ideas for your event! ETA: To those who've also asked why I don't just switch to comment moderation: that adds even more to the email overload. I already get hundreds of emails a day, sometimes up to 250 on a really big day. I can't fathom more! Perhaps our blog followers will help us settle a little debate we've had going on Facebook this week! Leave a comment below and tell Ciara which one YOU like best! And now on to this week's report...thank you all for your beautiful cards, inspiring AnyHero letters, and your generous donations! Ms Bizzell, McKinney TX....thanks for these awesome cards! Love the Halloween cards! Bev C, Sequim WA (and yes I know how to pronounce it! heehee!) Your cards are so cute, thank you sooooo much! The donation is MUCH appreciated...bless you! Janet L, Stayton OR - thanks so much for your cute cards...they're just wonderful! Your donation will make it possible to keep our boxes going...thanks! Dawn J, Caldwell ID, your cards are here...and soon will be over there bringing many smiles! Thank you! 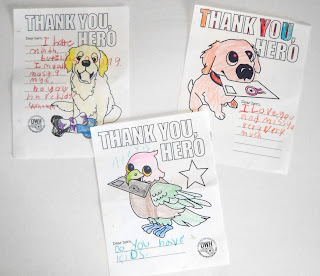 Melanie J, Snoqualmie WA, your cards are adorable...thanks for sharing your creativity with our heroes! And your donation too...you're so generous! 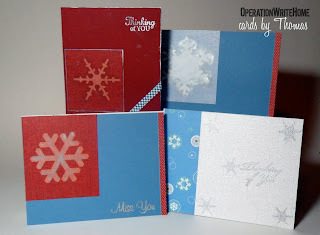 Melinda G. of Powell, OH, thank you for these gorgeous "Thinking of You" cards! Awesome! Laurie W. of Evans, GA, thank you for these terrific cards just for the children of our heroes! Lisa H of Rockport, MA, thank you for these delicious cards and generous donation! Wow!! Purple! Thank you Deb K, Carol F., and Judith S. of Glenville, NY for assembling these cards for our heroes! Awesome job! Debb R. of Scotia, NY, thank you for the cards, hero mail, and donation! Love these "Hello" cards!! Jessica H. of Needham Heights, MA, thanks for the nice variety of card fronts for our heroes! Sharon, H of Arlington, VA, you made my day with the punched button wreath! Thanks for the cards, donation, and Hero Mail! Marian J, Huber Heights OH....these are wonderful! Thanks so much. Robin H, Onalaska WI....Thanks so much for these fabulous cards, Any Hero notes and donation! Sharon N and Women of Monroe County, Waterloo IL.....WOW! 6 boxes of fabulous, gorgeous, beautiful Christmas cards! You all ROCK!! Dena L, St Cloud MN.....these cards are gorgeous! Thanks so you and your customers for making them for us. Veronica B, Oronogo MO......Awesome cards! Great job surpassing your goal!! Kiely B, Longmont CO.....Thanks so much for these fabulous cards!! Ashley L and Braun Heights Ward, San Antonio TX.....thank you for these wonderful Any Hero notes and the beautiful cards. Much appreciated. Dorothy B and Jazzy Janes Cardmakers, Corpus Christi TX....WOW, ladies these are beautiful. Thank you!! Rosalie R, Macomb MI....another great package of beautiful cards! Thanks! Bitsie F, San Angelo TX.....thanks for these awesome cards! Love them. Janelle K, Aberdeen SD......awesome package! Love your style! Kim N, Bloomington IN - your cards ROCK! Adorable! Jill F, Bloomington CA, what a fantastic first box of cards! Our heroes are going to love them! And your AnyHero cards are fantastic too! Andrea F, La Habra CA, love your cards, they're a rainbow of cheer! Cheryl Y, South Pasadena CA---your cards are so dang cute! Thank you so much for the fantastic AnyHero cards and generous donation too...you've made a lot of days much brighter! Cindy M, Pewaukee WI - congratulations on beating last year's card total - and in AUGUST! Go go go! Christina W. of Lake Placid, thanks for these great cards and Hero Mail!! Awesome fish! Sandy J. of Westerville, OH, thank you for the cards! Love the birthday boy cards with the trucks! Carol B of Saint Alban's, ME, thank you for the beautiful cards for our heroes! 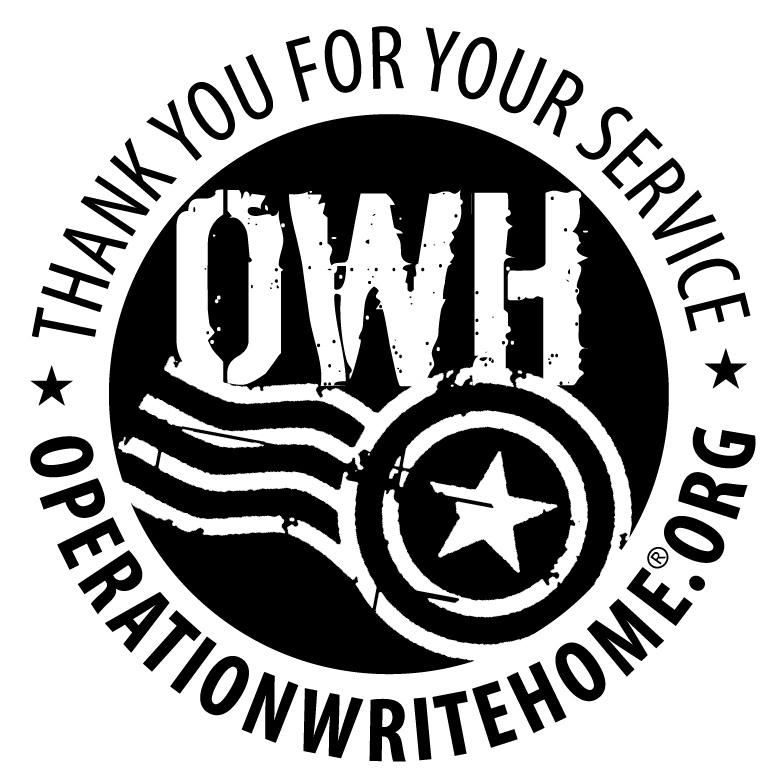 Moriah M. of Stow, MA, thank you for the cards donation, and Hero Mail! I love it when children write notes! Pamela L. of Mineral Bluff, GA, thank you for the "Thank You" cards!! LOL!! Just what I needed! Susan A. of Ridgewood, NY, thank you for the Hero Mail!! Pretty cards for heroes! Dolores A. of Frederick. MD, thank you for the cards, the donation and the hero mail! You're so thoughtful! Theresa P. of North Canton, OH, awesome cards for our heroes! So creative! Thank you! Cathy B and employees and their children at COLONIAL LIFE in Columbia, SC, many thanks for the cards and the terrific messages for our military heroes! Well done! Carol H. of Cincinnati, OH, thank you for the cards, donation, and hero mail! Awesome box of goodies! Pamela N. of Virginia Beach, VA, thank you for the cards and donation! So many card for kids! Thanks! Carol B. of Gonzales, LA, thank you for the beautiful cards and generous donation!! Thank you Larry B. for the letters to heroes!! Pat L. of Voorheesville, NY, thank you for the beautiful cards!! You have an awesome talent! Thanks for sharing it with your coworkers AND our heroes! Thank you New York State Office of the State Comptroller Volunteer Team in Albany, NY for the greeting cards, hero mail, and generous donation! You all did a fabulous job, and our heroes and their families will love the cards!! You all rock!! Lynn P. of Charlotte, NC, thank you for the cards!! I needed the "Miss You" cards for kids! Good timing! Suzette E and Kearney Newcomers, Kearney NE.....what a great package of beautiful cards. THANKS! Eileen M, Chama NM......fabulous!! Love your style!! Vicki W and everyone at the Treasured Memories Crop - thank you so much! Your cards are breathtaking - wow! Jane S and Monica J....darling cards, wow! Thanks so much! Your donation is a blessing too! Cindy E, El Cajon CA - I love your cards, and our heroes will too. Thanks especially for the ribbon - perfect for an AnyHero cardmaking day I'm planning! Helen R, New York, NY - love all your spooky cards, these are great! Lee B, Dalton WI - holy cow! All these boxes from you - have you been up late every night? Great job!! And lots of AnyHero mail...love them! Carolyn L, Darien IL - your cards always make me smile....so clean and crisp! Thank you once again! Cindy B, Dearborn Heights MI - thanks so much for the awesome TALL cards! You rock! Annette S. Gansevoort NY, thanks for your great package of cards! To our donor in Idaho Falls ID, thanks so much - your cards are really cute! Ann W, Knoxville TN - wowsers, you've been busy! So many beautiful cards, thanks! Patti S, St Louis MO.....thanks for these awesome cards! Linda M, Marietta GA.....WOW! Awesome cards. Thanks for having them stamped and sorted! 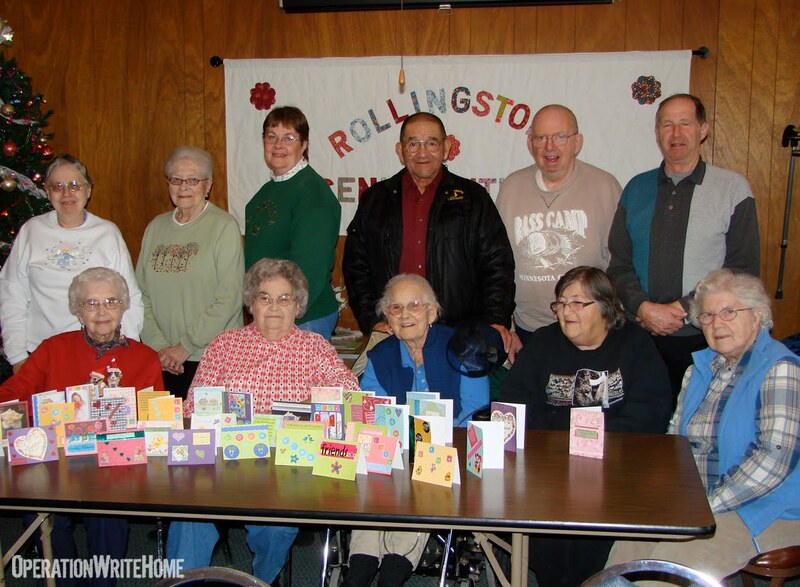 Rosalie R, Macomb MI.....another great package of cards!! Thanks so much. Lesley T, Kirkwood MO....WOW! great cards in so many themes. THANKS! Janice B, Houston Tx......thanks so much for these great fall cards!! Cindy B, Dearborn Heights MI.....what a great box of cards! Love the halloween ones! Michelle M, Cheyenne WY.....gorgeous cards!! Love them! Judy B, Cleburn TX....WOW!! These are awesome cards! Thank you! Sally C, Walcott IA.......thanks for the great box of cards! Jess, M. of Piscataway, NJ, thank you for the clever cards! All are so unique! Heroes will love sending these! Dawn L. of Westlake, OH, thank you for the cards and the generous donation for shipping! Awesome cards!! Jean B. of Meadville, PA for the cards, donation, and Hero Mail! Love the fall cards!! Doris T. of Carteret, NJ, thank you for the cards and the donation! Well done! Jane C. of Valdosta, GA, thank you for the terrific cards! So many designs and sentiments! Lina W, Hampton VA....thanks for these awesome cards. Laura S. of Kerhonkson, NY, thank you for these great cards! I especially like your collection of "Thank You" cards! Trini S. of Holly Springs, NC, WOW!! What a treasure trove! Thank you for the cards and the generous donation! Kelly H and students at Grandport Elementary, Ecorse MI......thank you so much for taking some time this summer to write these wonderful letters to our heroes. They will love them! Sharon N and ladies of Waterloo IL.......WOW! Two more awesome boxes of cards. That's 8 boxes in 10 days!! You all rock. Fabulous Christmas cards!! Valerie R, Nancy W, SandraM and Jennifer K, Lawton IA.....an awesome first box of cards! Love them. Welcome to OWH!! Diane S, Gallatin TN......thanks so much for these fabulous cards!! Lori D, Albuquerque NM.....WOW! Fantastic cards!!! Love them. Debby P, Buffalo MO......another awesome package of cards! Thank you. Emily W, Marissa IL......awesome cards! Thanks so much. Donna K, Gainesville MO......Fabulous cards!!! To our anonymous donor in Milwaukee OR - thanks so much! Please email Sandy so we can get your name in our system - thanks! Lindy C of Seattle WA - I love your cards!! So darned cute....and your donation and AnyHero cards are much appreciated! 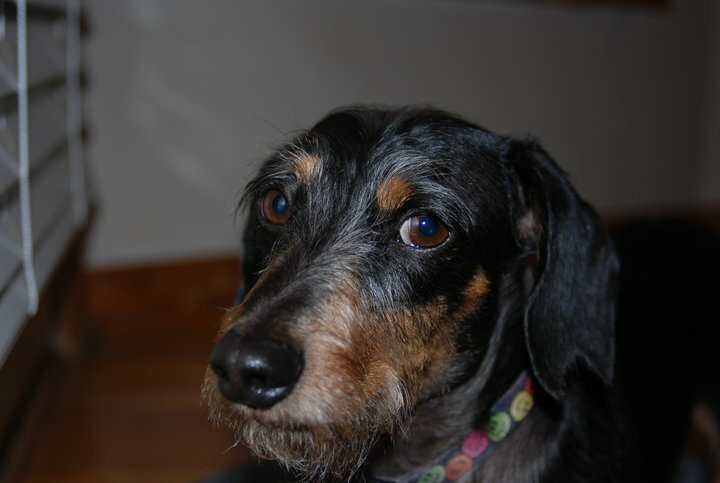 Kay W, Chattanooga TN - thanks so very much for your generous donation! Paula P of Bellevue, OH, thank you for the terrific cards and generous donation! What cute designs! 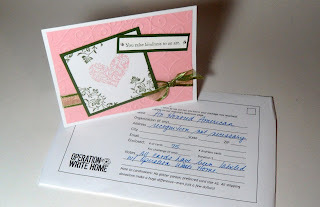 Denise I. of Williamsville, NY, thank you for lining and matching envelopes and organizing and shipping these cards! Thank you too for the donation! You rock! Monica D. of Hendersonville, TN, thank you for the pretty cards and the Hero Mail! Love kids cards to heroes! Donna H. of Seekonk, MA, thanks for the cards and donation! Love your Christmas designs! Let it snow! Debra K. of Burke, VA, awesome cards, donation and hero mail! Thank you for all!! Karen C. of Union Bridge, MD, thanks for the "Thinking of You" cards!! Beautifully done! Erica C. in Kenmore, NY, thanks for the cards, donation, and hero mail! Awesome designs! Love the Thanksgiving paper and cards! Jan R. of Akron, OH, thank you for these gorgeous cards! They are all gorgeous! Thank you too for the donation! Marianne K. of Harrisburg, NC, thank you for the cards! Love the Christmas cards! Anonymous, Dassel MN.....a wonderful box of cards with no name so I don't know who to thank. If it's yours....thank you....love these! 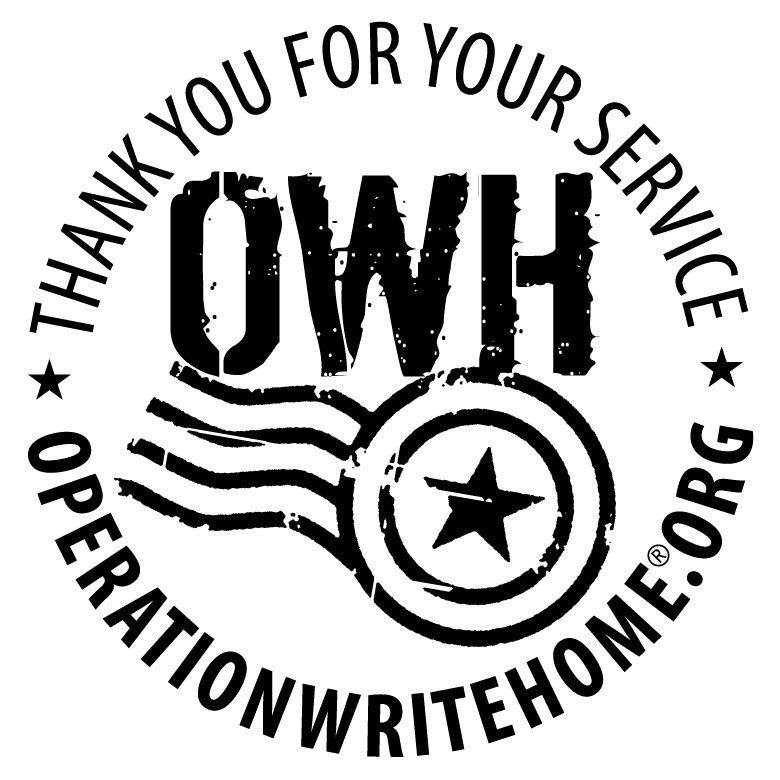 We make sure "Operation Write Home" is on the back of each card we send...then we get to hear back from families who write to tell us they got a card from their hero! We've also had new contacts sign up for cards when someone shared their box, so it's great to spread the word to more heroes. 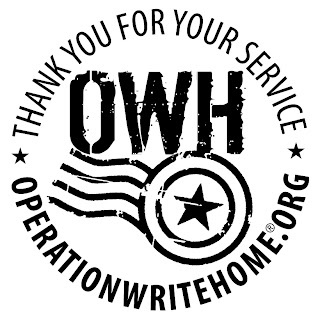 You can help out the shippers by assuring that "Operation Write Home" is on the backs of your cards before you send them in. Some folks print labels, others write it out by hand. But we're stampers, so...why not stamp it! You can snag the artwork below for any of our designs (click on the image, then download the following large image—if you don't, the thumbnails will be too fuzzy to print) and make labels or have a stamp made at your local office supply store. You can also have a stamp created in text only. Customizing it with your name, hometown, blog, or email address is just fine too! For your convenience, StampXpress carries our designs in their self-inking stamps, with customizable options (see their site for more information). 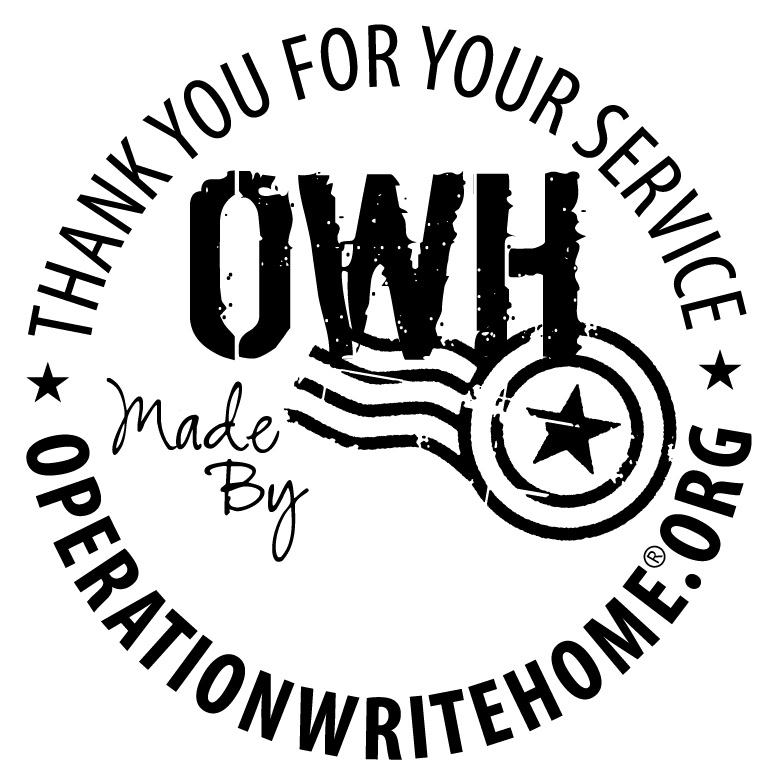 OWH does not make any money off the stamps purchased through these sites, nor do we have control over quality or handle returns. Our recent order of 600 stamps! While supplies last, we offer a FREE plain red rubber stamp. Note it has no cushion, backing, adhesive, or wood mount. No customizing. Just the rubber stamp. We want you to stamp the cards (and save our shippers HOURS of labor doing it for you!) that we're giving them away while we can! Please fill out this form with your address; Kris is packing them up and mailing them out for us. Please feel free to make a donation toward the cost of the stamps when you send in your cards...it's much appreciated! Remember, click on the image to make it larger in a new window, and then download. Rightclicking on these will produce a fuzzy image.